Altec Lansing Octiv 650 iPod dock comes with Music Mood app | What Hi-Fi? 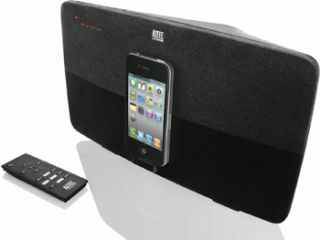 Another day, another iPod/iPhone dock, this time in the form of the £170 Octiv 650 from Altec Lansing. It's a 2.1 design with a 4in downward-firing subwoofer and a pair of 3in full-range drivers. There are component and composite video outputs to allow you to stream video directly from your iThingy to your TV, plus an aux input for connecting a second audio device, and a remote control. Perhaps the most novel feature is the free downloadable Music Mood app which lets users customise their listening experience with a seven-band graphic equaliser, as well as multiple presets. What's more, the app has a selection of "relaxing and ambient vidoes and sounds" for people to listen to, including a crackling fireplace, ocean waves and gentle rainfall. The Altec Lansing Octive 650 is available this month from Apple Stores, John lewis, Dixons and PC World. Initially available in charcoal, a grey slate version will be released in June.